This will mark the first time in 10 years that the Bahamas has hosted the championships. 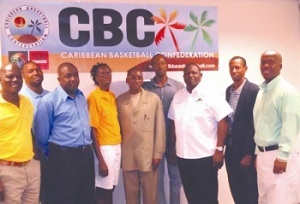 "The Caribbean Basketball Confederation is a sub-zone of FIBA Americas, which is a zone of the International Basketball Federation, which is either the second or third largest sports federation in the international Olympic Committee with some 212 members," Richards said. This year's tournament will feature teams from Jamaica, Virgin Islands, Antigua & Barbuda, Guyana, Turks & Caicos, British Virgin Islands, Bermuda, St. Vincent & the Grenadines, the Cayman Islands, Cuba, Trinidad & Tobago, the Dominican Republic and the Bahamas. According to BBF president Lawrence Hepburn, the men's tournament will be held under the patronage of Mychal 'Sweet Bells' Thompson, a former three-time NBA champion with the Los Angeles Lakers, and will be divided into two zones. Men's Zone A - Jamaica, Virgin Islands, Antigua & Barbuda, Guyana and Turks & Caicos. Men's Zone B - British Virgin Islands, Bahamas, Bermuda, St. Vincent & the Grenadines and the Cayman Islands. Although there are two names being considered as the honourees for the women's division, Hepburn said they will not make an official announcement until they have spoken to the relevant parties. But unlike the men, the women will play in one division. Women's Round Robin - Bahamas, Cuba, Dominican Republic, St. Vincent & the Grenadines, Trinidad & Tobago and Virgin Islands. From the tournament, the top three teams in both the men's and women's divisions will advance to the Centro Basket, which is made up of the top eight countries in the Central American and Caribbean. At the end of the Centro Basket tournament, the top four teams in the men and women will secure berths in the FIBA Americas Zone Championships. World Championships or the Olympics, which ever is held first at the completion of the latter event. Richards stressed that while it has been quite a while since the Bahamas has had a team that qualified for Caricom, this is a golden opportunity for the Bahamian public to lend their support behind the federation's efforts to get the job done this year at home. In endorsing the Ministry of Sports' commitment to the tournament, sports director Timothy Munnings said it's a great opportunity for the local, collegiate and professional athletes to band together to display their talent in a cohesive unit to get the Bahamas back as a powerhouse in the region. Munnings, an Olympic track and field athlete, said the ministry will do its part in assisting the federation in making sure that the event is a tremendous success through a small financial donation. "It's a great sports tourism initiative, so we hope to have the fine folks from the Ministry of Tourism on board with us," Hepburn stated. "We want to let the public know that there will be revenue for having these people here. We want the Bahamian people to make them feel special, so come out and support every team that comes in here because of the exposure that the Bahamas will gain from this."